These beautiful, hand-thrown teapots are the perfect combination of form and function! Each element of the teapot is hand molded by artist Kandace Lockwood to create a perfect no-drip spout, a comfortable wide handle, a beautifully crafted body, and a lovely lid that fits perfectly on top. Individually handmade right here in the USA, these stoneware teapots are true works of art that will add beauty to any table. We are particularly smitten with the glaze resist print-making technique that Kandace uses to create the paisley pattern. Arbor Teas was introduced to Kandace by one of our customers and we immediately fell in love with her pottery. Living in Clinton, New York, Kandace is dedicated to making a pottery line of high-quality functional objects that incorporate color and pattern. Kandace marks the base of each teapot with her initials. 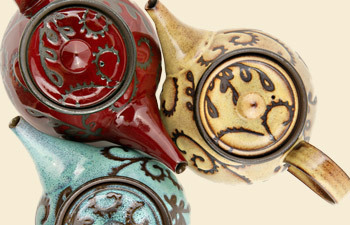 Please note: because each teapot is individually handmade, variations in color and shape can occur and are celebrated! Additionally, these teapots have an internal built-in filter at the base of the spout. This filter may not remove small tea leaves. If you prefer to use an infuser that will remove all tea leaves with this teapot, we recommend our small T-sac Conical Infuser or Stainless Steel Tea Filter. Available in red-brick, wheat, and dark brown. Holds about 25 oz.